At the end of last week’s article we enjoyed a winetasting with M. and Mme. Blot at the Domaine de la Taille aux Loups in Husseau, on the east side of Montlouis-sur-Loire. Leaving the domaine, we head east along the Loire à Vélo to Amboise, where we visit the great royal chateau. 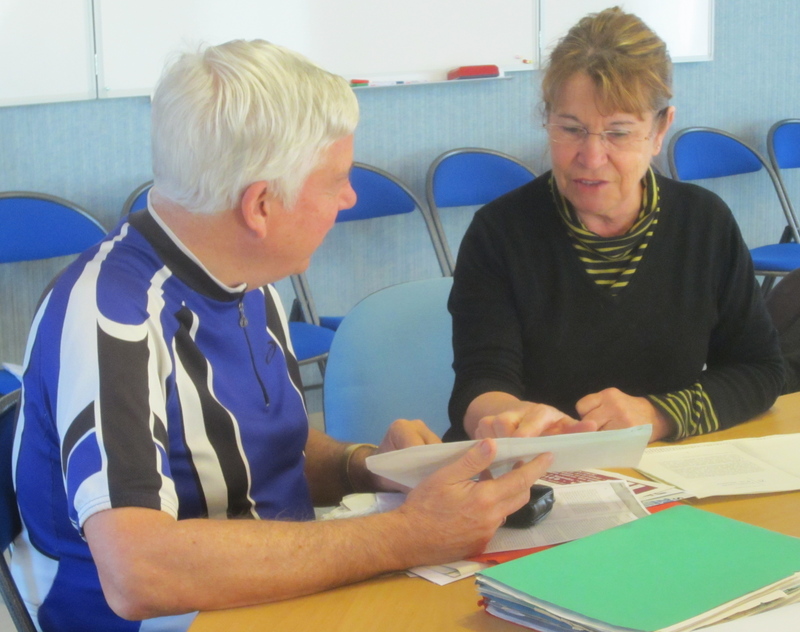 To see our route from Montlouis to Amboise in Google Maps, click here. 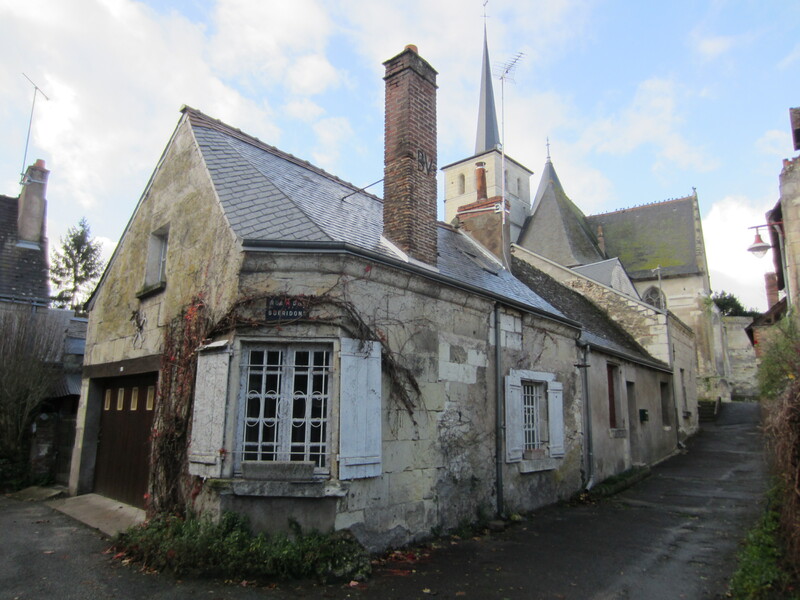 Next week we walk up the rue Victor Hugo in Amboise to Clos-Lucé, where Leonardo da Vinci spent the last three years of his life. Our route to Amboise is not along the Loire River, but up on the plateau, where we share the quiet roads with an occasional car. After a few kilometers we pass by the Aquarium du Val de Loire, which offers a convenient rest stop (02 47 23 44 44) for those who did not stop at the Taille aux Loups. I was biking this route in the summer of 2008, planning our Western student bike trip for 2009, and looking for a rest stop on a rural plateau with no cafes. I came around a corner and there was the Aquarium, to which we had taken our young children during summer vacations in Touraine two decades earlier. I had always come to it from the opposite direction by car, and indeed I had forgotten its existence. What a surprise to find it there on my proposed bike route. The perfect rest stop: if you don’t want to visit the aquarium, buy a snack at the counter, to thank them for the use of the washrooms. This is one of the largest fresh water aquariums in Europe, with some 10,000 fish in 4 million litres of water. The emphasis is on fresh water European fish, but there are also various exhibits involving sea water, including tropical fish, a coral reef, and sharks. My favorite fish is the silure, which looks like an enormous catfish out of a horror movie. They hang out on river bottoms and seem too fat too float or swim. 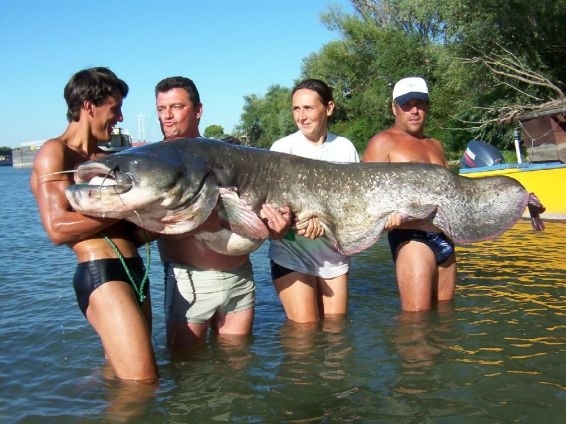 They can be up to 2.5 m long and weigh up to 250 kg, making them the largest fresh water fish in Europe. They do well in the lower reaches (below 400 m altitude) of the significant rivers of France, including the Loire, where a reduction in oxygen (through pollution) can make life difficult for other sorts of fish. 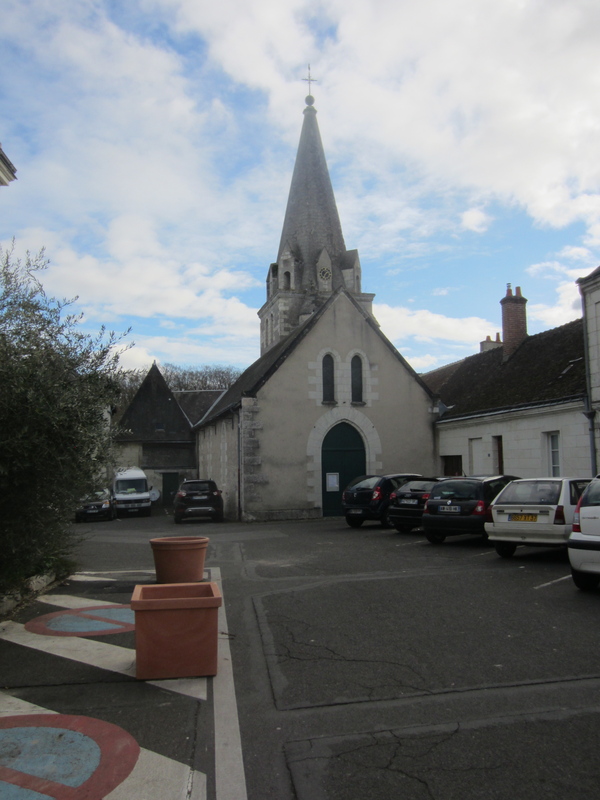 Leaving the Aquarium, our route continues east, and then turns south, down the hill past the impressive St. Denis Church to the Loire and Amboise. From the bridge over the Loire we have a fine view of the Chateau Royal d’Amboise. In the late 15th century the chateau was substantially expanded and renovated by Kings Louis X1 (who reigned 1461-1483) and Charles VIII (1483-1498). The work occurred just before the adoption by French monarchs of the new Italian Renaissance styles in architecture, and Amboise maintained the look of a fortified castle. Later renovations by Francois I (1515-1547) and Henri II (1547-1559) introduced the new Italian styles to the chateau. Our visit inside the chateau takes us to the Royal Apartments, which include a magnificent Council Room, with a double vaulted stone ceiling and beautiful fireplaces at either end. 3. 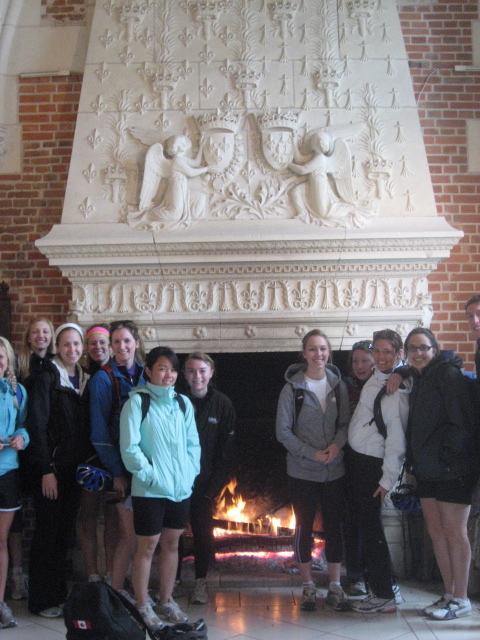 Students from the Western 2010 bike trip gather in front of a roaring fire in the Council Room on a very cold spring day. 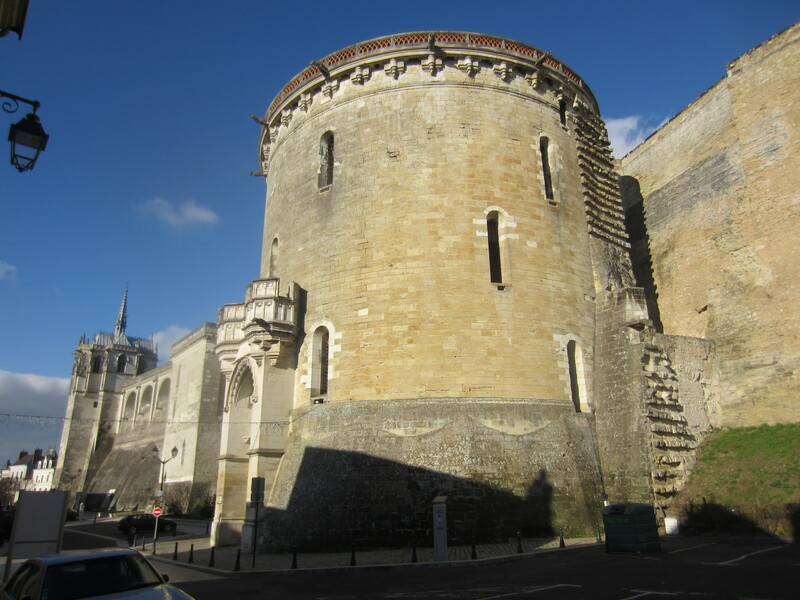 The large round tower on the left of the main building in photo 2 is the Minimes Tower, housing a large spiral ramp which was used to bring horses with carts up to the terrace to provision the chateau. The views from the tower are spectacular. 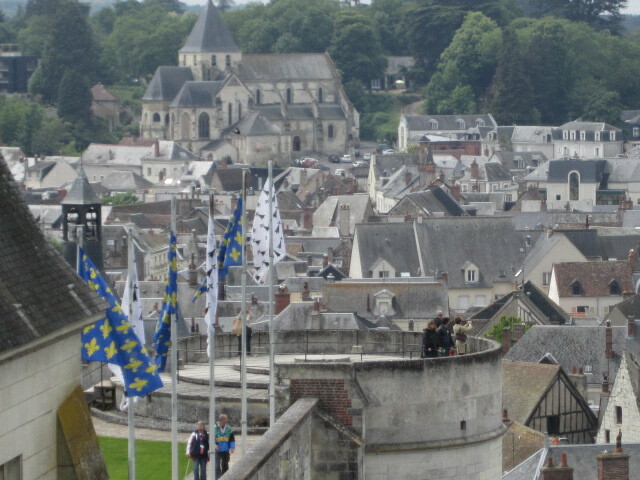 Looking west we can see the Boys’ Tower at the western edge of the Chateau terrace, the roofs of Amboise, and the massive St-Denis Church in the background. 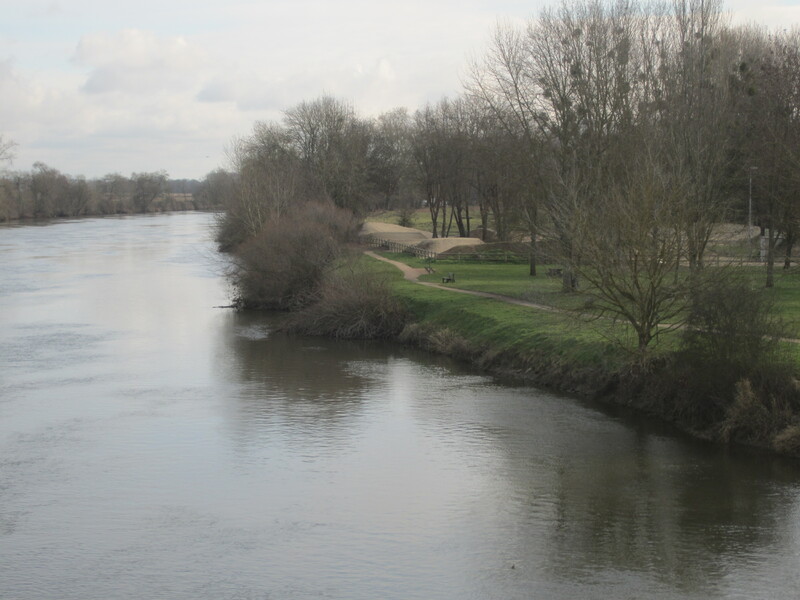 Looking east, we can the Loire winding down to Amboise. 5. 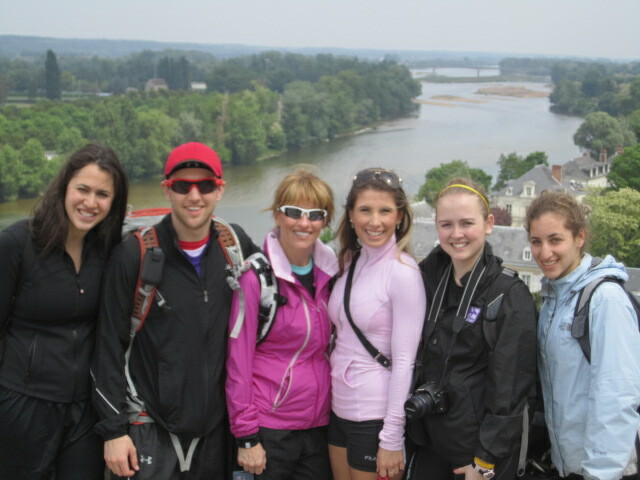 Students on the Western 2010 bike trip on the Minimes Tower. The beauty and peace of the chateau and the surrounding town may make it hard to imagine that they were the site of cruel, bloody events that took place here in March, 1560. Those events have left their mark on French history. Religion and politics should not be mixed. When they are, the result is often disorder and bloodshed, as France experienced in the seven decades after 1560. Among the best known events of the Religious Wars in France are the Saint-Barthélemy Massacre in 1572, and the assassinations of two kings, Henry III in 1589, and his son Henry IV in 1610. A portent of all this bloodshed were some brutal killings in Amboise in March, 1560, which had both religious and political dimensions. On the religious side, it all began with a German priest, Martin Luther, who in 1517 wrote his “Disputation of Martin Luther on the Power and Efficacy of Indulgences” (also known as the Ninety-Five Theses); he may have affixed them to the door of the church in Wittenberg, although many modern historians believe he simply sent them to his bishop. Luther argued that salvation could not be bought, but only achieved through faith in Jesus Christ. He wrote that our knowledge of God comes from the Bible, thereby disputing the authority of the Pope and his hierarchy. These views were offensive to the established Church, and in 1521 Luther was excommunicated by Pope Leo X. Today in Germany there are roughly equal numbers of Roman Catholics and Protestants. Luther’s ideas travelled quickly through Germany in a 16th century version of social networking involving pamphlets and ballads. His doctrines also spread to other countries in Europe. In France, the Reform movement was led by John Calvin, born in 1509 in Picardy. In university, Calvin was attracted to humanism, and then to religious Reform. His views forced him to flee to Switzerland in 1535. The following year he published his Institutes of the Christian Religion, setting out his Reform doctrines. Despite intermittent persecution, the number of Reformers or Protestants in France (or Huguenots, as their enemies called them) grew rapidly after 1850, especially among the nobility. 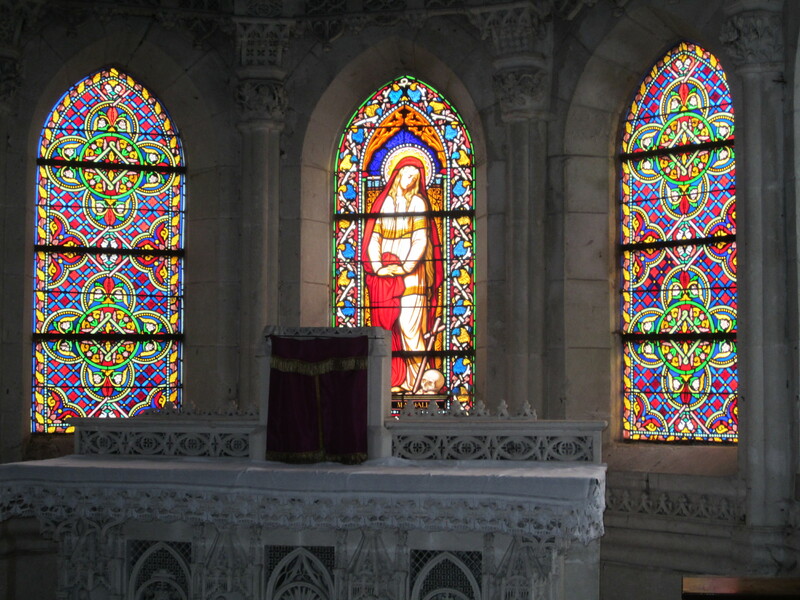 The criticism of each other’s church by Reformers and Roman Catholics was often bitter and extreme; each sought control of the French state as a means to control the rival church. These tensions came to a head with the sudden death of Henry II, after a jousting accident in June, 1559. His son became king at just 15 years of age, as François II. Through an arrangment concluded when he was four, François was married at age 14 to Marie Stuart, Queen of Scots (later imprisoned and put to death by Elizabeth I of England). When he became King, two of his wife’s uncles, the duc de Guise and his younger brother, the cardinal de Lorraine, became his chief advisors. They quickly took control of the government. 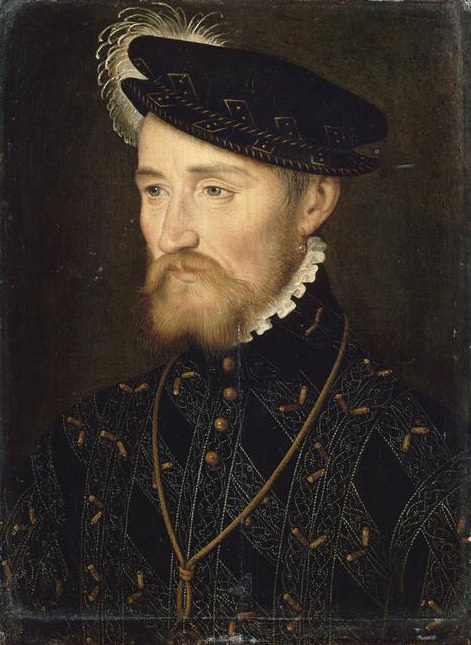 The painting below of the duc de Guise is by François Clouet, the official painter of King François I. 6. 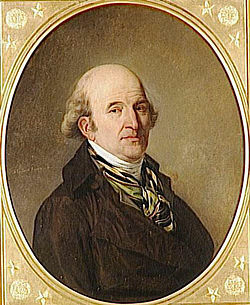 François, duc de Guise. The Guises became known for their violent suppression of Protestantism. The House of Guise was found by Claude de Lorraine (1495-1550), a valiant military commander under François I, who in appreciation gave him the title of 1st duc de Guise. In 1525 the duc de Guise suppressed a revolt of Anabaptists, a Protestant sect, in a massacre in Saverne, Alsace, which earned him the title of “the Great Butcher.” His son François, the 2nd duc de Guise, organized the massacre at Amboise in 1560. François’ son Henri, the 3rd duc de Guise, played a role in the St. Bartholomew’s Day Massacre of Protestants in Paris in 1572, and later founded and led the Catholic League (la Ligue Catholique), devoted to the anti-Protestant cause. 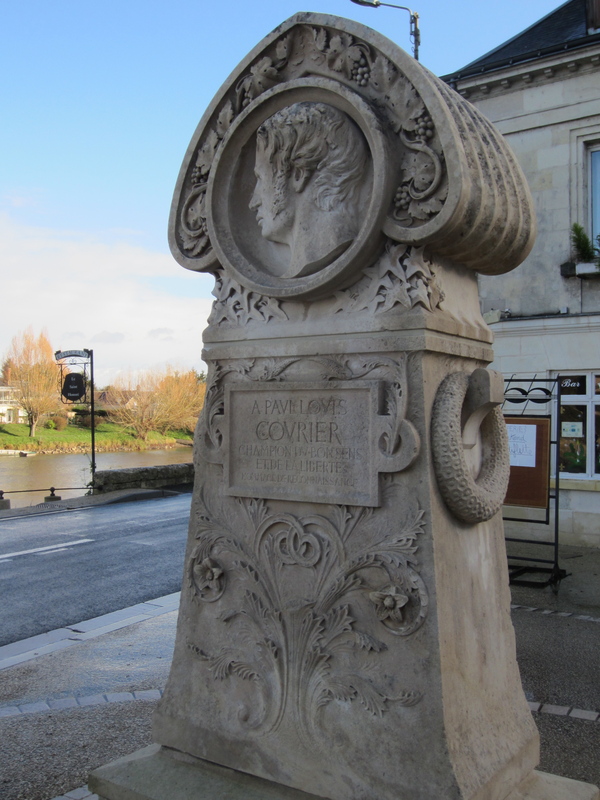 He was assassinated at Blois in 1588 on order of King Henry III, a story we will tell when our bike trips arrive in Blois. In early 1560 members of the Huguenot nobility began plotting to kidnap the King, and return him to power after they had removed the Guises. A meeting of the conspirators was held in Nantes on Feb. 1, 1560. 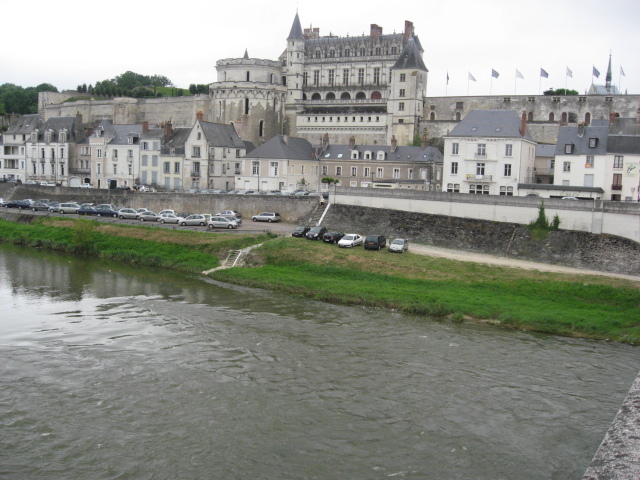 The plot was discovered and the King was moved from Blois to Amboise, where the Chateau was more defensible. 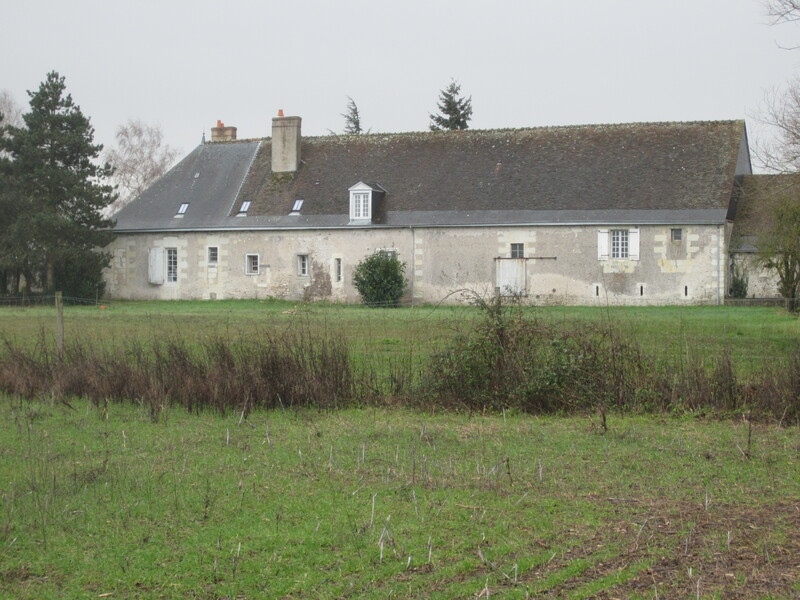 The conspirators were poorly organized, and an attack on March 17, at the gate of the Bons-hommes under the Heurtault Tower on the north side of the Chateau, was quickly repulsed by the troops of les Guises. 7. The Heurtault Tower, with the gate of the Bons-homme. In the distance, at the top of the wall, is the St-Hubert Chapel. 8. 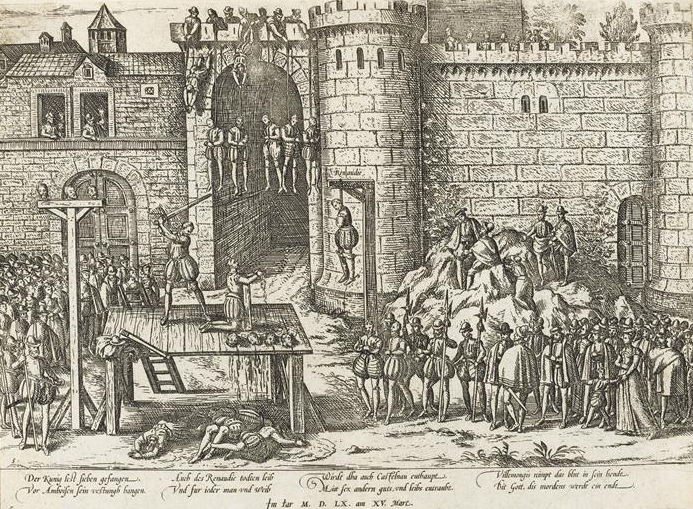 Jacques Tortorel and Jean Perrisin, "The Execution of the Conspirators of Amboise" (1570). 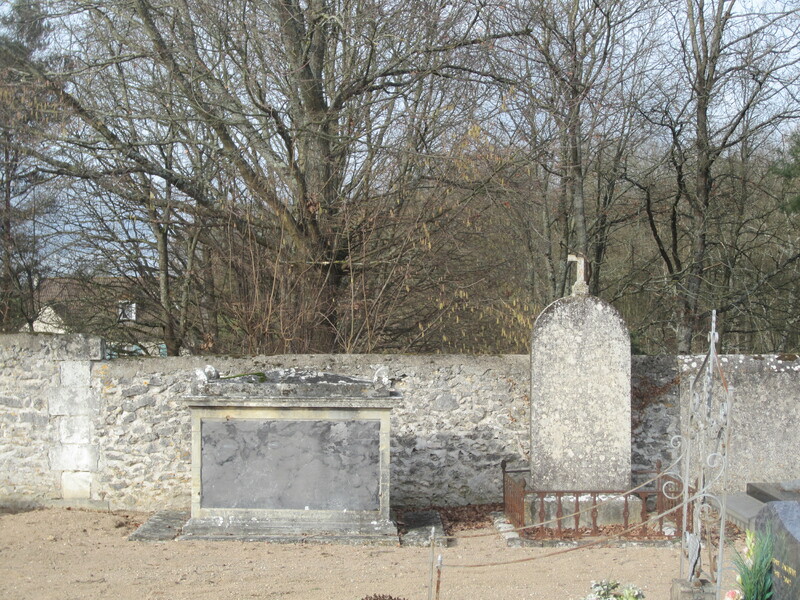 The engraving shows the north wall of the chateau, as seen from the direction of Photo 2. In addition to the troops present, there are a good many spectators, including, near the lower right corner, a woman with a young boy. The Huguenots are to be taught a lesson. Two men are being thrown from the chateau balcony with ropes around their necks. Five more are already hanging, along with a sixth on a gallows in the center of the engraving. The latter is the leader of the conspiracy, Jean de Barry, lord of la Renaudie manor in Périgord. 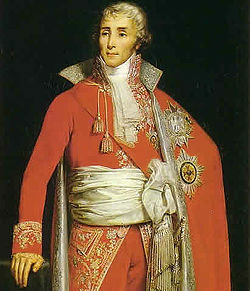 La Renaudie was killed in a skirmish on March 19 in the Forest of Chateau-Renault as he headed toward Amboise with a small troop. His body was displayed as the engraving shows, and then chopped into five pieces, each hung at a gate to the chateau. His words foretold 70 years of cruel religious wars in France. “How Luther went viral,” The Economist, December 17, 2011, pp. 39-41. 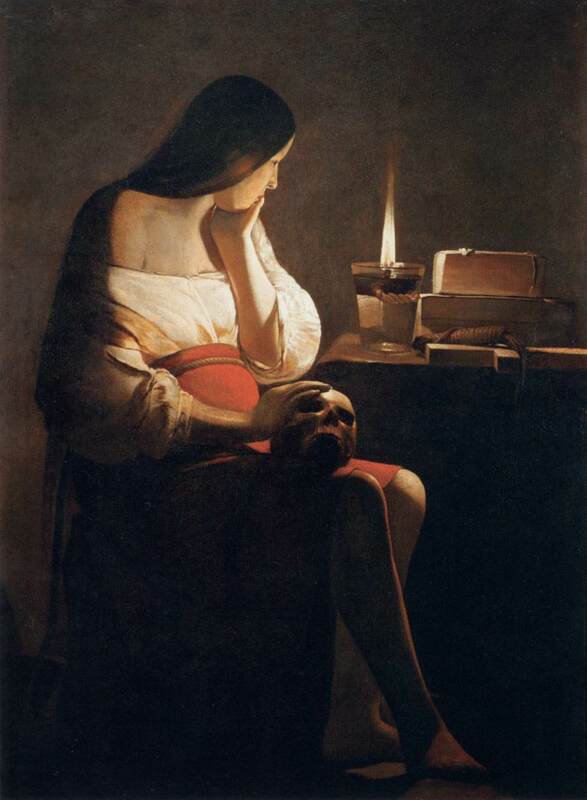 A remarkable exposition of the work of Tortorel and Perrisin was held in 2006 at the Musée de la Rénaissance at Chateau d’Ecouen north of Paris, in collaboration with the Bibliothèque National de France. The title was D’encre et de Sang – Les guerres de Religion gravées par Tortorel et Perrissin (Ink and Blood – the Wars of Religion engraved by Tortorel and Perrissin). A summary of the exposition can be downloaded from the museum website, musee-renaissance.fr. Villemongis is identified by Nicolas Le Roux, Les Guerres de Réligion 1559-1629 (Editions Belin, 2009), pp. 42-43, where the engraving in Photo 4 is also shown, although in a mirror image (left and right are reversed, as compared to Photo 4). 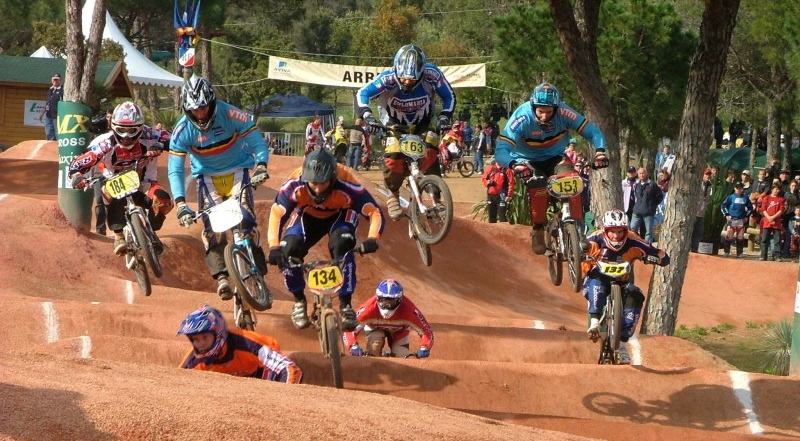 Photograph 1 is from the website http://www.magicsilure.fr. Photographs 6 and 8 are from the Wikipedia Commons, commons.wikimedia.org. All other photographs were taken by the author. We all know the admonition that driving and alcohol don’t mix. I agree. It is equally important to understand, however, that biking and wine do mix. This is especially true in Touraine, where the quiet country roads through the vines present the cyclist with truly spectacular views, and where nothing is more wonderful than stopping at a vineyard to taste the local product, and discuss winemaking and wine with the winegrower. The bike trip from Tours to Amboise is 32 km, or 64 km roundtrip. 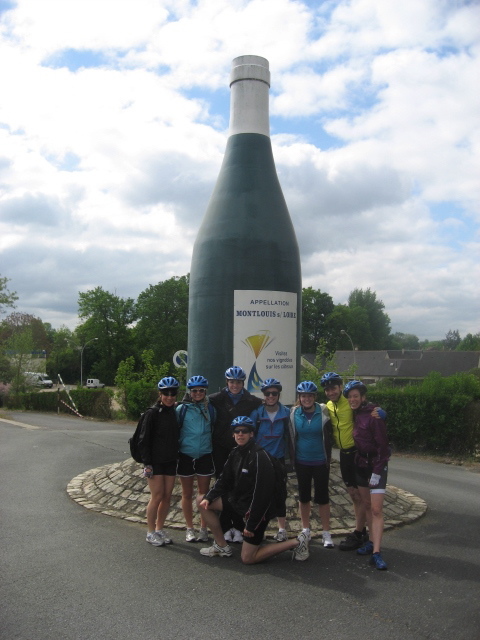 On this post we will bike to Montlouis-sur-Loire, through some lovely vineyards. Next week we continue on to Amboise. 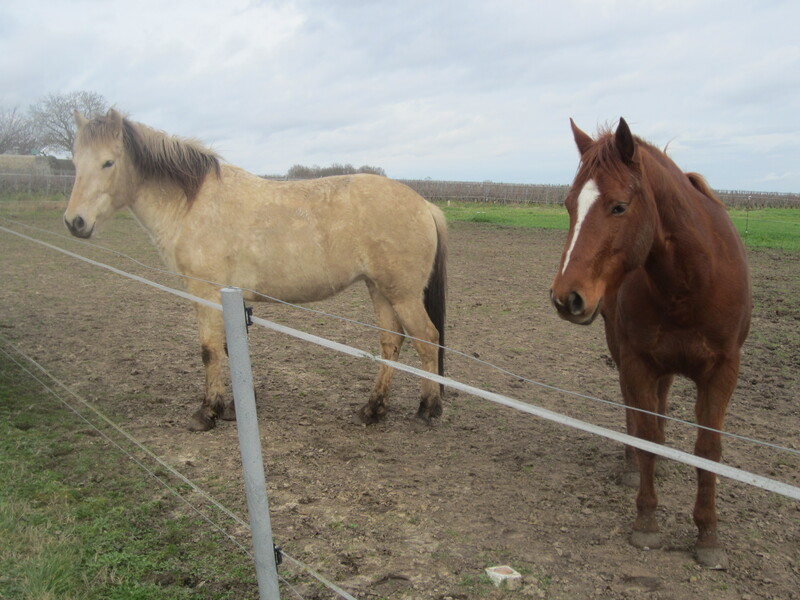 To see our route to Montlouis in Google Maps, click here. 1. Three students on the 2007 University of Western Ontario student bike trip examine a Loire vineyard's progress in early May. 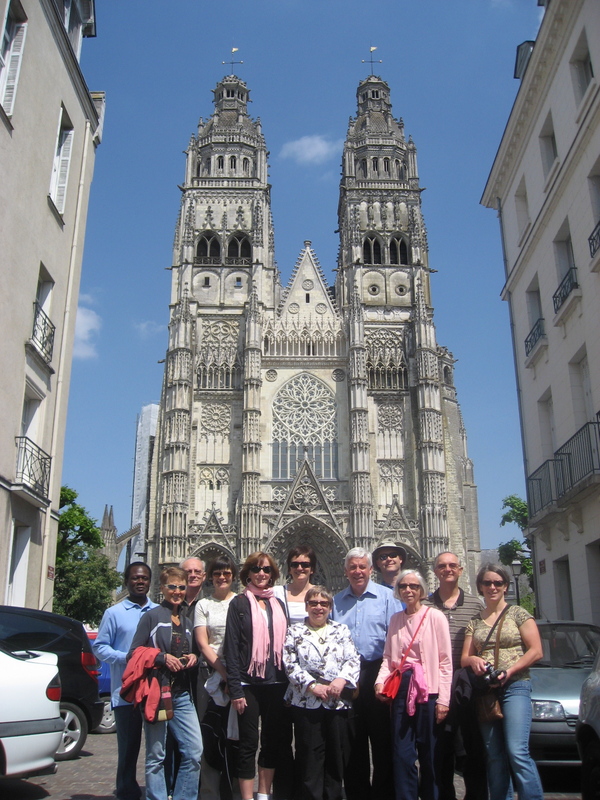 Beginning at the Tours train station, our bike route heads north to the Loire River, passing the St-Gatien Cathedral, where we pause in the square facing the church to admire the extraordinary facade. The cathedral was built over 300 years, from the 13th to the 16th century. The facade, with twin tours, similar but not identical, has a wonderfully harmonious feeling, despite the fact that it includes elements of Romanesque, Gothic, and Flamboyant Gothic architecture, all crowned with two lovely lanterns in the Renaissance style. 2. The 2010 University of Western Ontario alumni and friends bike trip in front of the St-Gatien Cathedral. 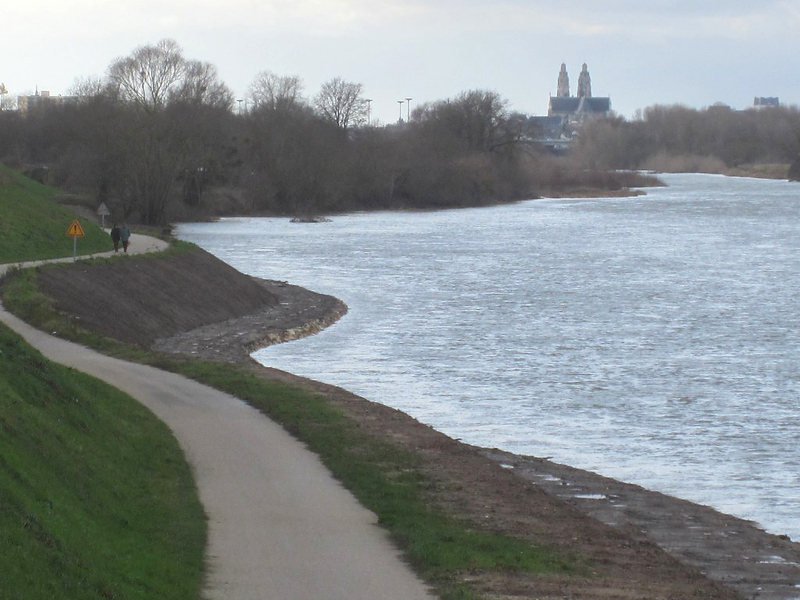 From St-Gatien we bike our way to the wide sidewalk, which also serves as a bike path, on the left bank of the Loire, heading east, and thus upstream. 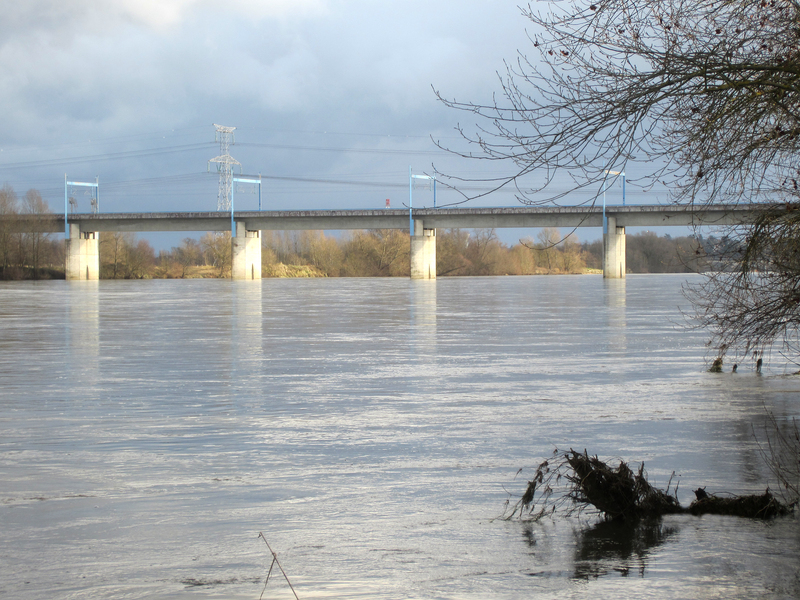 The road goes under the Autoroute 10 (Paris – Tours – Bordeaux) and leads us to the Loire à Vélo bike route, with no cars and beautiful views of the Loire. 3. 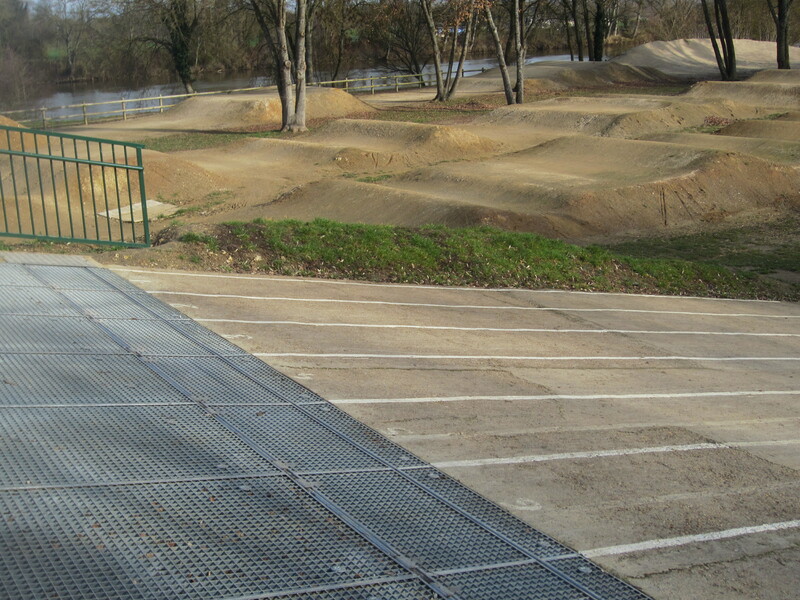 The Loire à Vélo in winter. In the background are the spires of the St-Gatien Cathedral in Tours, about four kilometers to the west. 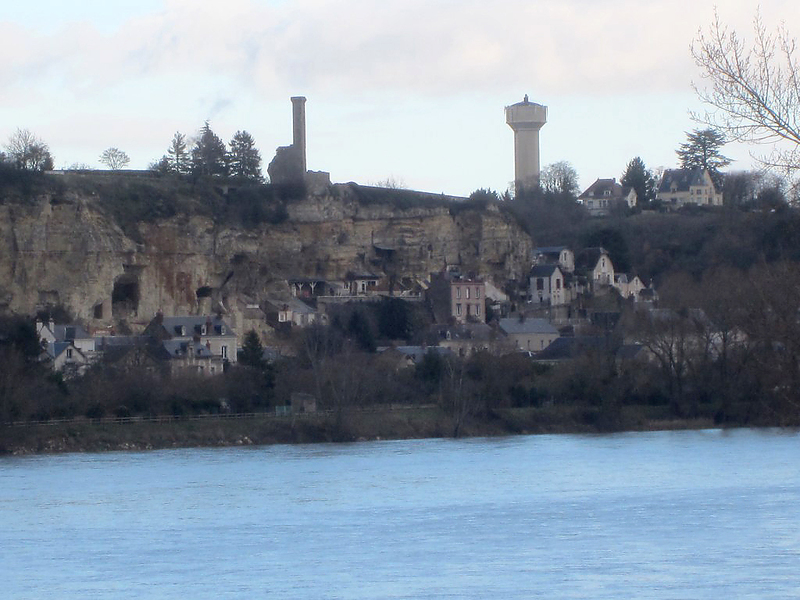 On the opposite bank of the Loire are the cliffs of Rochecorbon, with troglodyte dwellings that include modern homes, restaurants, and a hotel. At one point we can see atop the cliff the Lantern of Rochecorbon, which once may have guided boats on the Loire but is now part of a private home. 4. The Lantern at Rochecorbon, with troglodyte dwellings on the cliff side. The large structure on the right is a water tower. 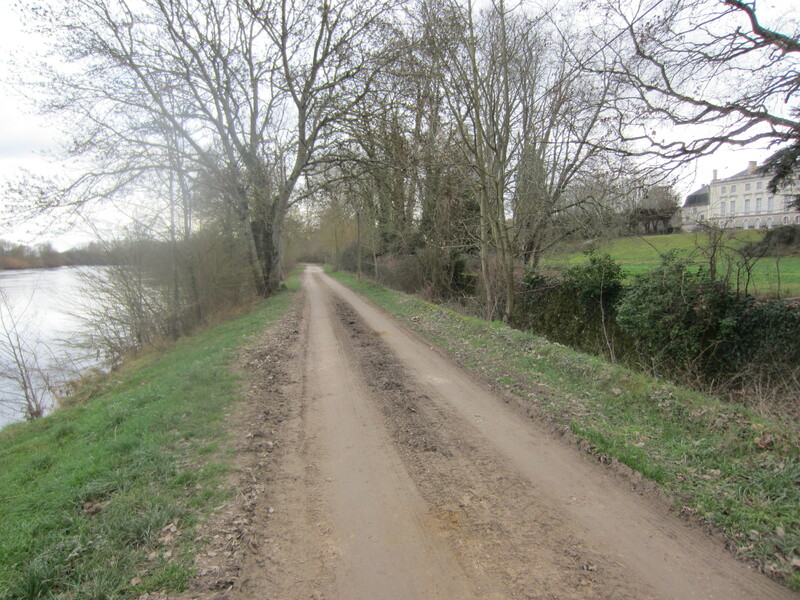 As we approach Montlouis-sur-Loire, the bike route leaves the river valley, climbing to the levee on the left bank of the river. Nearby is a giant six meter wine bottle with a Montlouis-sur-Loire label. 5. The 2011 Western student bike trip at the Montlouis bottle. Leaving the Montlouis bottle, we arrive in front of the Montlouis-sur-Loire City Hall. Across the street from the City Hall is a rest stop, the Bar Le Bugatti (02 47 50 90 40). We have gone 15 km. From Montlouis we head east, entering a residential district with some large attractive houses behind impressive stone and concrete walls. The road runs east on the cliff above the river, and then turns south past a water tower (chateau d’eau), and then east into farmland, divided among pastures with beautiful horses grazing contently, and vineyards featuring the Chenin grapes of Montlouis wine. We are still on the Loire à Vélo bike trail, which will take us all the way to Amboise. The Montlouis vineyards generally look south, turning their backs on the Vouvray district across the Loire River. Montlouis and Vouvray white wine are both made from Chenin grapes–no mixtures here with other varieties. If there is a grape that defines Loire wine, it is the Chenin, described by Hugh Johnson, the famous wine critic, as “the Loire’s own grape, the Chenin Blanc.”  While the history of the Chenin grape in the Loire Valley is a bit uncertain, it goes back over a thousand years. Records dated 845 from the Glanfeuil Abbey (also known as the Saint Maur Abbey) indicate that Chenin blanc was grown on the left bank of the Loire at that time. The Benedictine abbey, thought to have been founded in the 6th century, was in the town of Le Thereuil, which sits in a lovely spot on the left bank of the Loire, midway between Angers and Saumur. The Chenin grapes migrated east along the valley of the Loire and in the 15th century reached Touraine, where they are associated with Thomas Bohier (d. 1524) and his brother-in-law, Denis Briçonnet (1473-1535). Bohier built the Chateau de Chenonceaux, completed in 1521, and planted several varieties of grapes around the chateau. The Chenin thrived. After the death of Bohier, who was found to have embezzled a large sum of money from the Treasury, the chateau passed to King François I, whose son, King Henry II, adored the chateau’s Chenin wine. 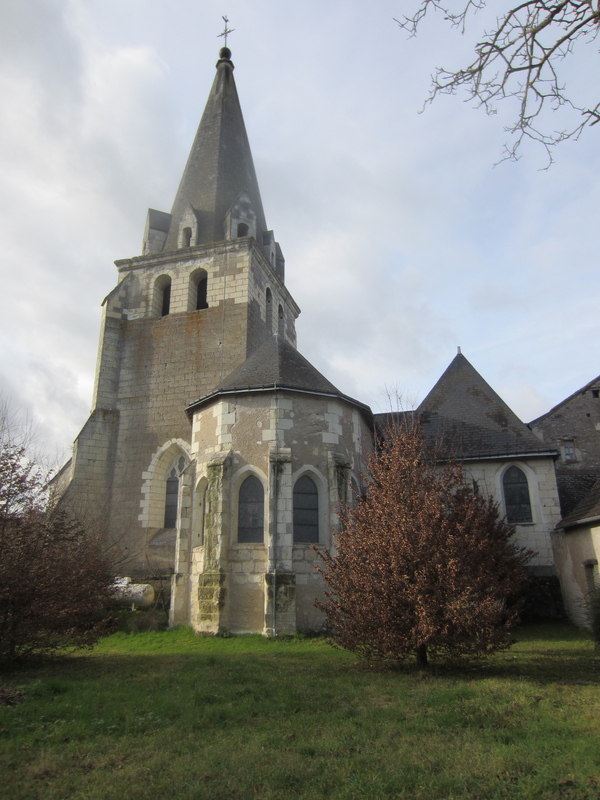 Denis Briçonnet was the abbot of the monastery in Cormery, on the Indre River. 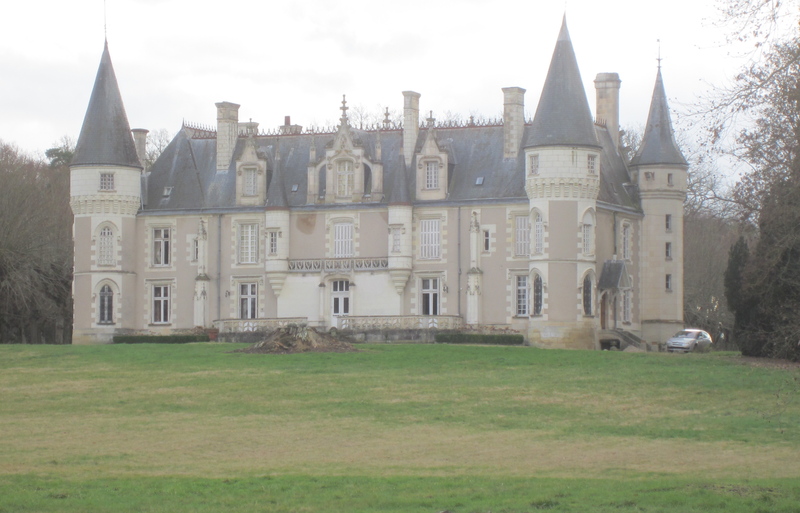 He lived in the nearby Chateau de Montchenin, where he grew a wide variety of wines, including Chenin. 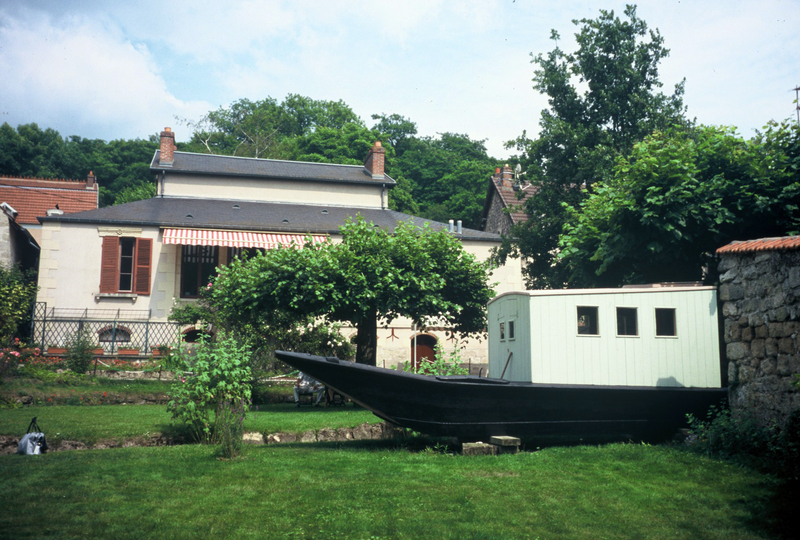 A building was erected on this property in the 19th century which now serves as a medical clinic with the name Clinique du Chateau de Montchenain. Opinion is divided as to which of the two chateaux gave us the Chenin name: Chenonceaux or Montchenin. 7. A fork in the road on the west side of Montlouis. 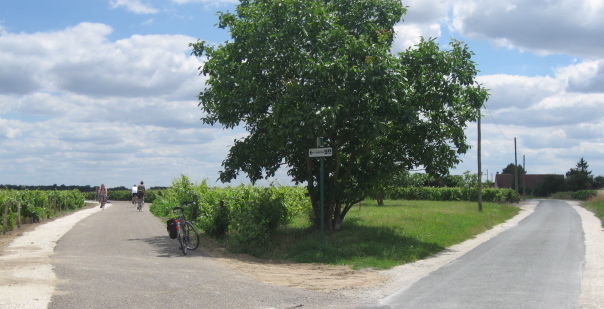 The Loire à Vélo bike trail goes left, as the sign in front of the tree indicates. The Montlouis vines surround the trail. It is Bastille Day, July 14, 2008, and the grapes are growing well. 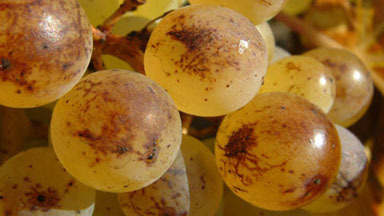 Rabelais goes on to list a variety of grapes, beginning with “pineau-grapes,” the name then for Chenin. The grapes even have medicinal properties–a young shepherd injured in the attack by the bakers has his legs “dressed … with big chenin grapes, so that they soon healed.” Shortly after this initial skirmish, Friar John, of the nearby Abbey de Seuilly, courageously beats off the marauding neighbors in order to save the abbey vineyard. Wine is very important in Rabelais’ world. 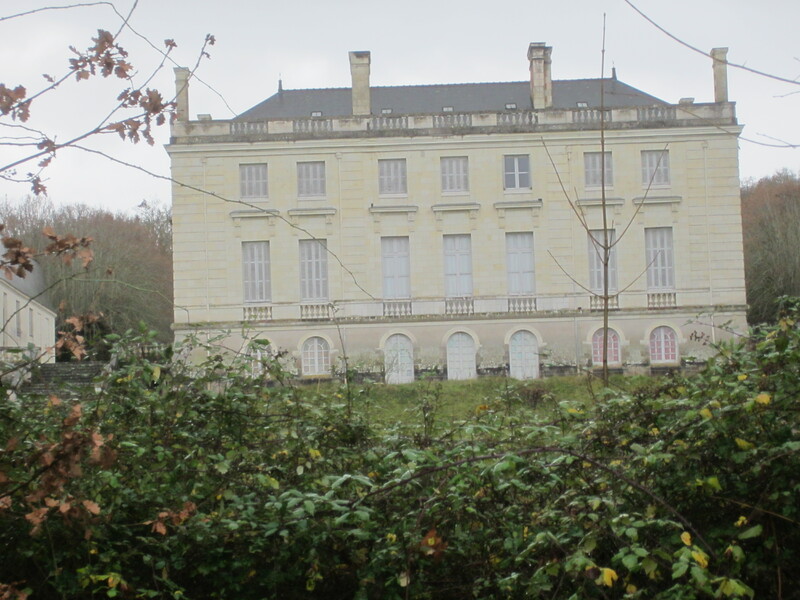 Honoré Balzac consumed great volumes of Vouvray wine during his frequent visits to a chateau in Saché, south of Tours. It is said that his work routine at Saché involved consuming two or three bottles of Vouvray at dinner, then entertaining the company with imitations of his characters, before heading to his bedroom and working from midnight to 10 AM the next morning. Some of his characters also enjoyed Vouvray wine. In 1938 Mountlouis-sur-Loire was established as a separate region from Vouvray by the authority of the AOC (Appellation d’Origine Controlée), which controls who can put a particular name on a bottle. The AOC acts as an agent of quality control, so that when you buy a Montlouis (or other AOC wine), you should know what are getting. Back on our bike trip, we reach Husseau, on the east side of Montlouis. As we leave the vines we arrive at an intersection with a Loire à Vélo sign, with its distinctive image of a cyclist and wheels in white on a green background. One direction heads to Amboise, the other back to Montlouis and Tours. 8. 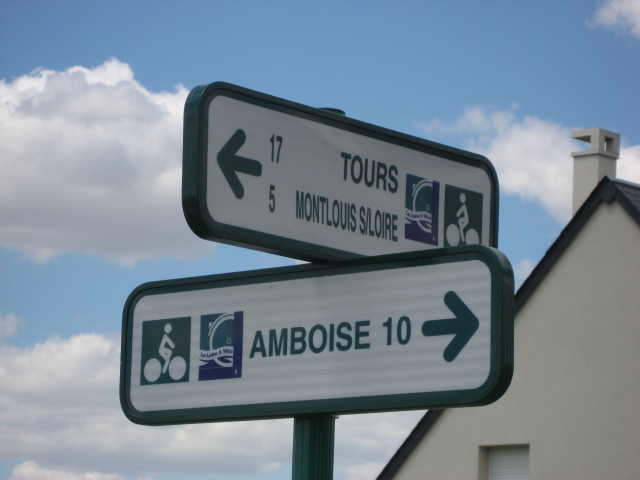 A Loire à Vélo sign in Husseau, on the east side of Montlouis. Nearby we stop for a wine tasting at La Taille aux Loups vineyard. Late one afternoon, I had a fascinating visit with the winegrower, Jacky Blot, in a lovely wine tasting room on his estate. He is a cultured and articulate man, with a deep commitment to his profession. M. Blot spoke for 30 minutes on wine in general, and Loire wine in particular. He explained that he was not born to wine growing, but came to it through a passion for the activity (“Je ne suis pas originaire de la vigne. Je suis venu à la vigne par passion”). For many years he worked as a wine broker, making the link between the growers and the buyers (wholesalers, retailers, restaurants). He then decided, in 1989, that what he really wanted to do was grow the wine himself, rather than taste and broker someone else’s wine. He currently farms 65 hectares (163 acres), producing 300,000 bottles of wine a year. His full-time team is 16 people; at harvest time (les vendanges) he will have 100 people in the fields. M. Blot bought some good parcels in Montlouis, and began to grow his own wine with the Chenin grape, as required in Montlouis and Vouvray. He describes the Montlouis wine district as bounded by the Loire and Cher Rivers and the Amboise Forest, which long ago would have given his property its name. La Taille aux Loups can be translated as “the wood where the wolves gather,” as they would have done for centuries (they are gone now); la taille refers to a wood made up of small trees and underbrush. In 2002, he bought good winemaking land in Bourgeuil, about 60 km downstream on the right bank of the Loire, so that he could apply his wine making skills to a red Loire wine. The wines of the Domaine de la Butte are grown with the same attention to quality as the wines of Domaine de La Taille aux Loups. M. Blot spoke at length of his philosophy of wine growing. I remarked that I have long felt that Loire wine is not sufficiently appreciated abroad, or even in France. He responded that wine regions become well known because of the elite growers who make the best wine, wine that is complex and takes great care in growing: the reputation of Bordeaux is based on the outstanding wine of just 10% of the land in vineyards, and for Burgundy, 20%. His view of the Loire wines is that for the most part the region has not had such leaders in quality, and the wine estates have been content to produce simple wines that are good but not outstanding. Thus if Loire wines are not fully appreciated, it is the fault of the growers themselves. 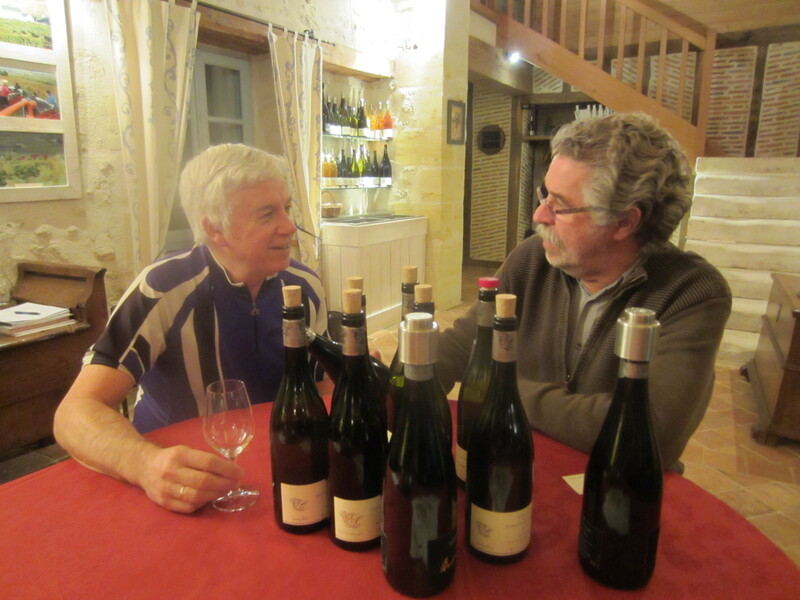 He sees his mission, and that of other growers who share his view, as establishing some truly outstanding Loire wines that will bring the reputation of the whole area to a new, higher level. 9. M. Jacky Blot in the winetasting room at his Domaine de la Taille aux Loups. I asked M. Blot what makes a great wine. He said that the determinants of a great wine are widely known, the same for all regions of France, and for the most part unchanged for the last 100 years. You must begin with an outstanding terroir, a soil that has the right composition and drainage to produce a great wine. You then need to plant the right vines for that soil. If you have poor soil, or plant inferior vines, no amount of work or care thereafter will produce a great wine. Then comes the care of vines in a manner that respects nature: no pesticides, insecticides, or fungicides; a reasonable quantity of grapes per vine; hand picking at the right time under the right conditions. Once the grapes are pressed at M. Blot’s vineyard, there are no adjustments, chemical or otherwise, made to the pure juice of the fruit: the wine is made on the vine and not in the cave (“le vin se fait dans la vigne, il ne se fait pas dans la cave”). A great fruit, and nothing else, makes a great wine, and that is true everywhere (“un grand fruit fait un grand vin, c’est ca et rien d’autre, et ca c’est vrai partout”). Suitably fortified, next week we will continue our bike ride east to Amboise, famous for its Royal Chateau and for the Kings who lived there. Hugh Johnson, The World Atlas of Wine, 4th edition, 1994, p. 114. Johnson, op. cit., p. 117. François Rabelais, Gargantua (Seuil, 1996), p. 213. Rabelais says that the young shepherd’s legs were dressed “avec gros raisins chenins.” Rabelais, op. cit., p. 216. Some English translations drop the reference to chenin grapes, which is unfortunate. 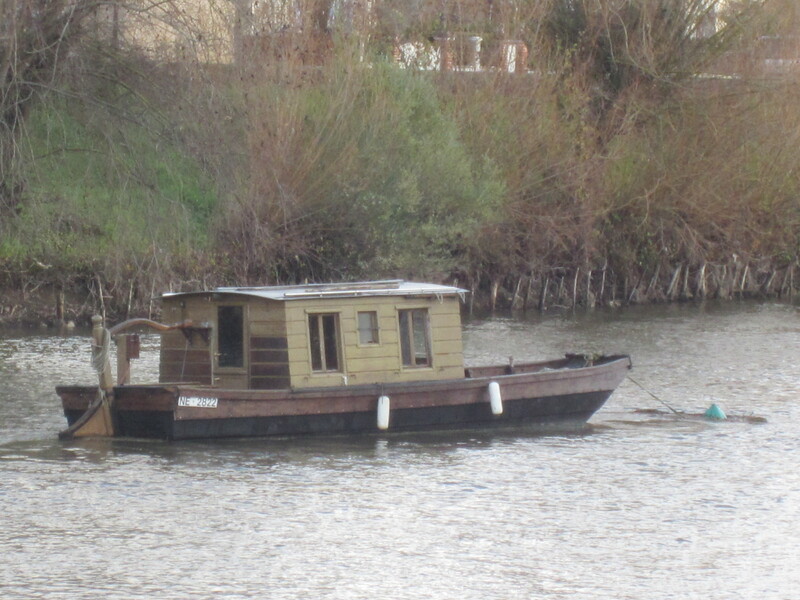 “Jacky Blot, installé depuis 1989, ne dérange que les esprits conformistes de la Loire. Soucieux d’excellence, ce vinificateur de chenins charmeurs bouleverse le ronron rustique du cabernet bourgeuillois.” Le meilleurs vins de France. Photograph 6 is from M. Blot’s website, jackyblot.fr. All other photographs were taken by the author or at his direction.